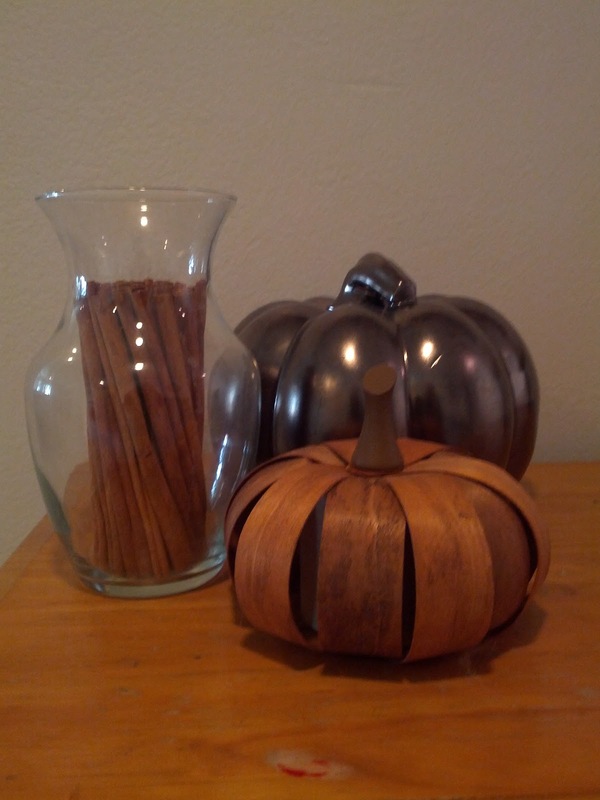 Here are some little Fall arrangements I've put together around my house! I love seasonal decorating. We had some Fall milestones this week: it rained for the first time, I started burning my Fall candles, and I've begun wearing sweaters and boots (and don't sweat profusely). Here are some tips for making your home feel like Fall. + Put long cinnamon sticks in a clear glass vase. You'll kill two birds with one stone by putting out something that looks really cute and smells good! + Mix and match with your themes. Pick any Fall or Holiday theme or object, and go crazy! I went with pumpkins, since I felt like they would carry all the way through November. 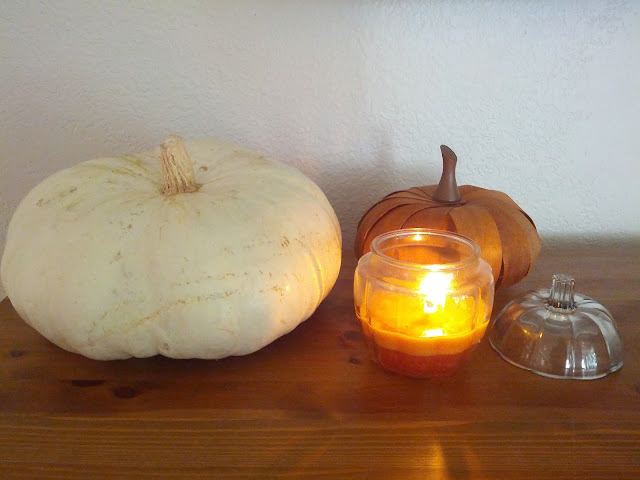 I've mixed pumpkin candles, real pumpkins, and wood or ceramic pumpkins, all in various colors (but all neutral). You could do the same thing with leaves, pine cones, spider webs, bats, etc. + Burn your favorite candles, or make your own home deodorizers. I'm already burning one candle called White Christmas, and this one, which is my all time favorite. For home deodorizers, just put some water in a saucepan and add anything that smells good to you. Some really yummy scents are sliced lemon, ginger, cinnamon sticks, or a sprig of Rosemary. Combine to your heart's content! + Put your favorite blankets on your bed. Now that the nights are cooling down, you can make your bed a little warmer and fluffier. Add your favorite quilts and pillows! + Schedule some super yummy Fall meals, like chili on rice, beef Stroganoff, and your favorite soups! Crock pot apple sauce and apple butter are also great to add to the list. Hope you're feeling inspired for Fall!